Just south of Moab, Utah where the Green and Colorado Rivers meet in a majestic setting called "The Confluence," Cataract Canyon begins. Bolstered by the Green River, the Colorado River doubles its force, and carves a deep 100-mile-long chasm through the heart of Canyonlands National Park. Here you'll experience the total thrill of class III-V Colorado River whitewater. Discover absolute relaxation on calm stretches of river that wind through soul-stirring canyons and dazzling geologic formations. Go back in time as you explore ancient Native American ruins and fascinating pictographs. Finish your adventure with a stunning flight over Canyonlands National Park as you return to Moab. Western's Cataract Canyon 4-Day trip offers the perfect balance of adventure, discovery and relaxation in an unbeatable setting. RAFTING Class III-V whitewater rafting (rapids depend on water levels). HIKING Short walks to longer, more difficult hikes (all optional). CAMPING Cots, tents, sleeping bags, chairs and water-resistant bag. TRANSFERSTransportation from Moab to the river. SCENIC FLIGHT Return flight over Canyonlands NP and shuttle to Moab. The trip information was great. We followed your packing list to the letter and ended up using everything we brought, but not lacking anything. Good work on that. Wonderful trip. 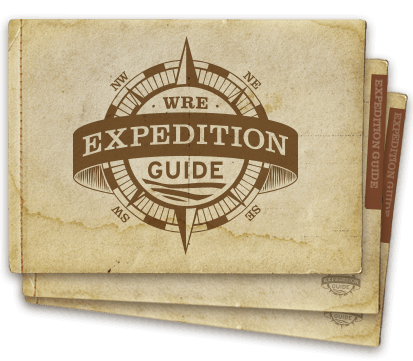 I was just thinking that there is no way this trip would be accessible or possible without Western River. I have wanted to run Cataract Canyon for decades. Without you it could have never happened. Also, my wife had a great time. She is not really an outdoorsy type person, but with the way you run your trips it makes it possible and enjoyable for her. I appreciate the fact that you deal seamlessly with every detail, down to parking the car, transportation to and from the river, and the orientation. And of course the main parts of the trip run like clock-work - the river run itself, hikes, meals, camping, etc. Nice job. I can't think of a thing that would improve our experience. This was our second trip with Western River. Our guides were informative, professional and entertaining! It was awesome from minute one to minute end. That’s it for me, it doesn’t get any better than this. We came down here for a four day rafting tour and yet we got so much more. This was first class all the way. 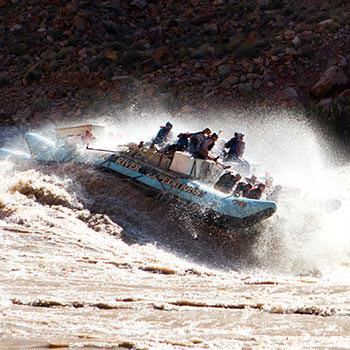 During May and June when water levels are the highest in Cataract Canyon, Western uses its patented J-Rig raft for the most secure, comfortable, and thrilling ride on the river. As the water slows its pace later in June and through July and August, we change from 37’ J-Rig rafts to 18’ oar rigs, and smaller paddle rafts. These smaller boats make these later trips more suitable for teens or active adults looking for a more “hands-on” experience. Whether you travel aboard the larger rafts earlier in the season or the smaller rafts later in the season, the legendary whitewater in Cataract Canyon provides plenty of fun and excitement. Note: The date in June or July at which we switch to smaller boats is determined by water levels which are difficult to predict before spring. On this Cataract Canyon vacation, you'll spend 3 nights on the banks of the Colorado River. Professional river guides cook delicious meals for you and all the camping equipment you need is supplied. This is camping made easy.